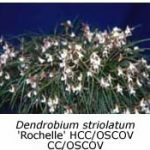 Over the last twenty years I have accumulated a large number of Australian native dendrobium species and their hybrids. Most are grown in open-sided shade houses that are either permanently fitted with fibre-glass roofs or have clear plastic sheeting fitted temporarily during winter and spring. 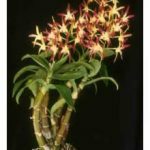 This article describes those dendrobiums that I have found to grow and flower best under these conditions. Virtually all native dendrobiums are prone to frost damage and therefore it is necessary to provide some form of protection during winter. A solid roof constructed with either fibre-glass or polycarbonate sheets is preferable at this time but its presence at other times means that one has to water throughout the year, whether rain has fallen or not. Another disadvantage of a permanent roof is that it traps hot air during summer, and as a consequence the plants suffer from hotter conditions than they would otherwise experience in a shade house simply covered with shade cloth. A temporary cover fitted during winter and early spring protects the plants and buds from frost during winter and prevents the flowers being damaged by heavy rain in spring. When removed after the flowering season is over the plants experience a cooler environment and better ventilation than they would receive in a house with permanent roofing. The only disadvantage is the hassle of fitting and later removing the plastic sheeting each year. Long-lasting Solarweave® sheeting fitted with belt eyelets simplifies this task – one of my covers is still in good condition after ten years’ use (admittedly it’s stored indoors during summer, the season when most deterioration would otherwise occur). Most of my native dendrobiums are grown in pots that are either suspended from the roof or hung from vertical wire mesh fitted to the end walls. In this way the plants receive maximum light and ventilation, both of which are essential for good culture. Nearly all are grown in squat pots and are planted in a mix of pine bark and river stones (4:1). The size of the bark and stones depends on the size of the plants – seedlings are grown in 5 mm bark with similarly sized stones, and transferred to 5-10 mm material after a couple of years. I sieve out the smaller material from the 5-10 mm bark to provide larger bark for large plants. Not all plants are grown in pots. 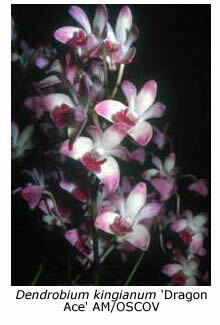 Some dendrobiums, particularly those now known as dockrillias, are grown on mounts, either of tree fern or natural cork. During summer I water the dendrobiums every second day, although in very hot weather I water daily, preferably in the evening. 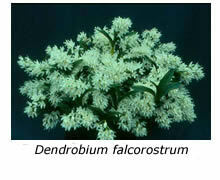 Weak liquid fertiliser (usually Campbell’s A®) is applied every week or two; it’s important not to use a nitrogen-rich fertiliser because such fertilisers promote the development of keikis at the expense of flowers, particularly in the case of Dendrobium kingianum and some of its hybrids. The plants need less water in spring and autumn and the frequency of watering and fertilising should be reduced accordingly. The plants are watered weekly in winter but not fertilised at this time. 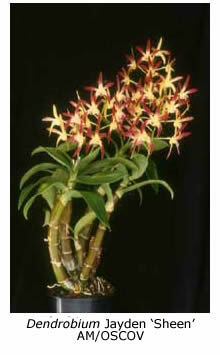 Australian native dendrobiums are prone to attack by several insect pests. Aphids are particularly fond of the new growths and flower buds. It’s important to spray for these pests as soon as they are detected, not only to minimise the immediate physical damage they cause, but also to reduce the likelihood of them transferring virus from one plant to another. Orthene® is an effective aphicide but it’s not sold at normal outlets, being available only in 1 Kg packets from large suppliers. Another common pest is the leaf-roller caterpillar, which sows the new leaves into a protective cylinder, thereby sheltering from pesticide dusts and contact sprays. One of the worst pests is scale. When present on the foliage, these insects are easy to control with summer oil but when they secrete themselves in the grooves on the older canes they seem much more resistant. However, I find that the insecticide Malascale® will eradicate them, particularly if the treatment is repeated and the heaviest infestations are physically scraped off the worst spots. 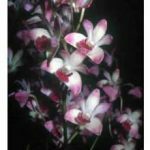 By far the most commonly grown Australian native orchid is Dendrobium kingianum, although many plants in older collections are bush-collected plants with small pink flowers on weak, pendulous racemes. Today, many line-bred D. kingianum seedlings that are likely to bear strong, upright racemes of much larger, more colourful flowers are available. Colours range from all white through white with purple lips (sometimes referred to as variety Silcockii), white with pink stripes to all shades of pink up to purplish red. Some cultivars carry two or even three racemes per cane, and up to ten flowers per raceme, making spectacular specimen plants at maturity. D. kingianum seems to be more prone to frost than many other dendrobiums, so grow it in a ‘cosy’ spot in your shade house, not on the perimeter. Also, it’s prone to develop keikis instead of flowers if fertilised with nitrogen-rich fertilisers (or with heavy applications of potassium-rich fertilisers). Another of my favourites is D. falcorostrum, a species that definitely enjoys winter cold (it sometimes experiences snow in its native habitat in the mountains of NSW). Its glistening white, perfumed flowers are a delight in the shade house but not indoors, where its perfume soon becomes overpowering. Dendrobium speciosum , in its six different varieties, occasionally provides a marvellous spectacle at spring shows, but I hesitate to recommend it to new growers in Victoria. Seedlings bred from selected cultivars are likely to provide the most rewarding plants but if you intend to follow this route, start young, because they will probably take ten years before they bloom! And then within a few years the plants in flower will be too large to remove from your shade house, let alone get into your car to take to a show! Add to these difficulties the widely held view that D. speciosum flowers well in Melbourne only every third year (when we receive above-average hours of sunlight), and you can see why I’m reluctant to recommend it, even though I admit to growing a few seedlings myself. 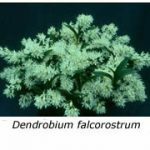 In preference to growing D. speciosum, I would suggest that new growers acquire some of its hybrids, for example D. Delicatum (D. speciosum x D. kingianum) or D. Andrew Persson (D. speciosum x D. falcorostrum). These hybrids flower reliably each year on much younger, smaller plants, although eventually they, too, can develop into massive specimens. Another well-known species is D. tetragonum but I don’t find it easy to grow and would therefore recommend in preference some of its hybrids, such as D. Hilda Poxon (D. tetragonum x D. speciosum) or D. Star of Gold (D. tetragonum x D. falcorostrum). Both hybrids produce large yellowish flowers, generally two or three times each year (a trait inherited from the first named parent). Every collection should include a few representatives of those dendrobiums now known as dockrillias. Many of these have pendulous cylindrical ‘leaves’ supported on a wiry rhizome. Examples include Dockrillia teretifolia, D. schoenina and D. mortii, which grow well for me on tree fern mounts. The first two grow well when hung up high but the third does better under the cooler, shadier conditions that prevail lower down in my shade house. 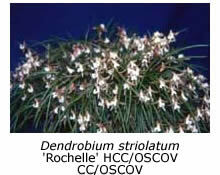 D. striolatum may be grown either in a pot or on a mount. Eventually it develops into a large ‘mat’ that produces an impressive display of flowers in spring. Last but by no means least are the so-called hot/cold, warm/cool or Tropicool™ dendrobiums, most of which are bred by crossing the cooler-growing species of section Dendrocoryne with Dendrobium bigibbum, the warmth-loving species commonly referred to as the Cooktown Orchid. Primary hybrids bred from D. bigibbum need winter warmth in Melbourne but seedlings bred from these primary hybrids are quite amenable to cultivation in a cosy shade house. Two hybrids which have done well for me on the show bench are D. Anne’s Rainbow Surprise (D. Colonial Surprise x D. speciosum) and D. Jonathan’s Glory (D. Colonial Surprise x D. Kingrose), both bred by Issy Klein and named after his grandchildren; each of these hybrids has D. bigibbum as a great-grandparent. The strong, upright racemes, large flower size and deep purple colour of this species are traits that seem to be inherited by its hybrids through multiple generations. Every collection of Australian native orchids should include a selection of these popular eye-catching hot/cold dendrobium hybrids.